The recital of Rylee Kramer is presented in partial fulfillment of the Music Education degree. Rylee is from the studios of Elaine Moss and Dr. Kortney James. The recital of Megan Lau is presented in partial fulfillment of the Music Education degree. Megan is from the studio of Dr. Kortney James. 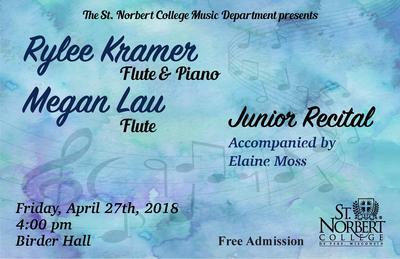 St. Norbert College Music Department, "Junior Recital - Rylee Kramer and Megan Lau" (2018). Music Performances. 55.